My son really got frustrated over the unhatched eggs of the Sea Monkeys which I purchased last month on ebay. It is supposed to be Khalil’s birthday gift. But since there is no hope that the eggs will hatch after they were placed inside the tank last week, we are already contemplating of disposing the purified water along with the unhatched eggs this morning. But lo and behold! We saw this tiny creature about the size of a sesame seed swimming inside the plastic tank! The Sea Monkey is alive! My son has yet to learn from the good news. I’m pretty exited for my son so I took this video right here using my Kodak EasyShare C713. It’s the tiny white speck moving in between two magnifying windows of the tank. I hope you’ll see it clearly towards the end of the video. Enjoy the wonder of nature through this “Science toy(s)”. Just ignore the background sound or turn off the volume to appreciate the sea monkey. If taken care of properly with enough food and clean water, this water pet will stay alive for two years! Isn’t it amazing?! This is how a sea monkey looks like up close. 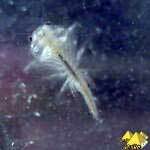 This entry was posted in Pet and tagged Amazing Live Sea Monkey on August 23, 2010 by Mommy Yam.